Quick overview In Messy Maths: A Playful, Outdoor Approach for Early Years, Juliet Robertson offers a rich resource of ideas that will inspire you to tap into the endless supply of patterns, textures, colours and quantities of the outdoors and deepen children's understanding of maths through hands-on experience. In Messy Maths: A Playful, Outdoor Approach for Early Years, Juliet Robertson offers a rich resource of ideas that will inspire you to tap into the endless supply of patterns, textures, colours and quantities of the outdoors and deepen children's understanding of maths through hands-on experience. Juliet believes being outside makes maths real. In the classroom environment, maths can seem disconnected from everyday reality - but real maths is really messy. Lots of outdoor play and engaging activity along the way is a must, as being outside enables connections to be made between the hands, heart and head, and lays the foundations for more complex work as children grow, develop and learn. Following on from the success of Dirty Teaching (ISBN 978-178135107-9), Messy Maths reimagines the outdoor space through a mathematical lens - providing a treasure trove of suggestions that will empower you to blend outdoor learning into your teaching practice. It is not a `how to' guide, but rather an easy-to-use reference book replete with ready-to-use games and open-ended ideas designed to help children become confident and skilled in thinking about, using and exploring abstract mathematical concepts as they play outside. Many of these ideas and activities are also beautifully displayed in full-colour photographs throughout the book, making it even easier to jump straight into outstanding outdoor learning opportunities. Topics covered include: general advice; exploring numbers; number functions and fractions; money; measurement; time; pattern; shape and symmetry; position, direction and movement; data handling; routines; and the mathematical garden. Each chapter features a section on topic-specific vocabulary and expressions to help you integrate terminology into each area of study, while suggestions for embedding maths into routines are also provided to assist in the development of creative, progressive and flexible approaches to everyday situations. 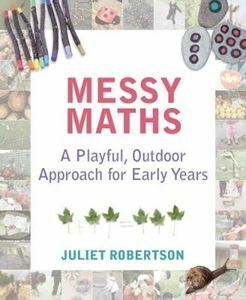 Messy Maths is suitable for early years educators (of ages 3-6) who want to shake up their usual classroom practice and make the most of any outdoor space - whether this be a nursery, playgroup, child-minder's back garden or a nature kindergarten - as a context for maths.